In order to referee for PoCo Euro-rite FC, you must complete our club registration. This can be found at HERE. Your credentials will be verified through BC Soccer before any matches will be assigned. You only need to register once. Your information will be kept on file from season to season. You must complete your annual Refresher Course/BC Socer Registration in order to keep receiveing game assignments. For information on becoming a referee. or for the annual refresher course, see our Development & Courses Page. We are currently redeveloping our Referee Mentorship and Education Program. Please check back for more details! Just like our players, we want all of our referees to grown and learn. That is why we are committed to providing both on field and off field mentorship and education. Through regular meetings and onfield evaluations, we strive to help you reach your full potential as a match official. Boys generally play on Saturdays and Girls on Sundays. Can I referee the same day I play? Yes – as long as the games don’t conflict, you can referee the same day you play your own game. How do I send my availability? 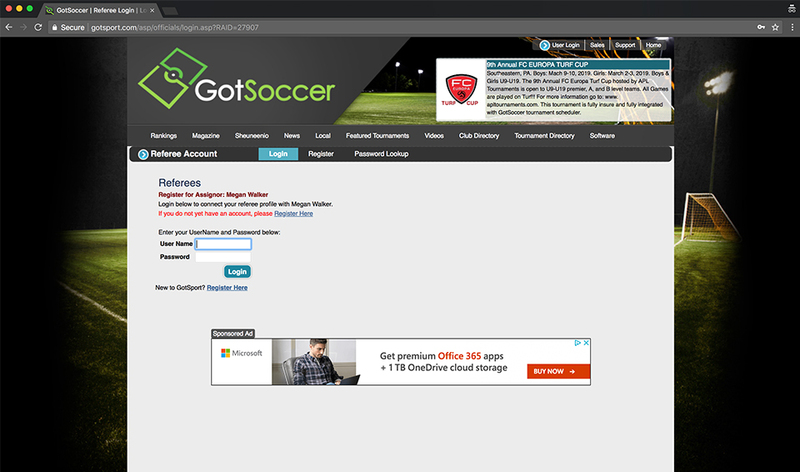 You need to log into our GotSoccer Referee account and indicate your availability. All assignments will be done in the GotSoccer system, and you must accept them in the syste as well. Be sure that your availability is correct by Tuesday each week so that you can be assigned games. Games are held at various parks in Port Coquitlam. Please see our Field Page for specific locations. Gates Park and Ecole Des Pionnierres are main fields. How much do I get paid to Referee or Assitant Referee a match? What do I do if I give out a card during a game? 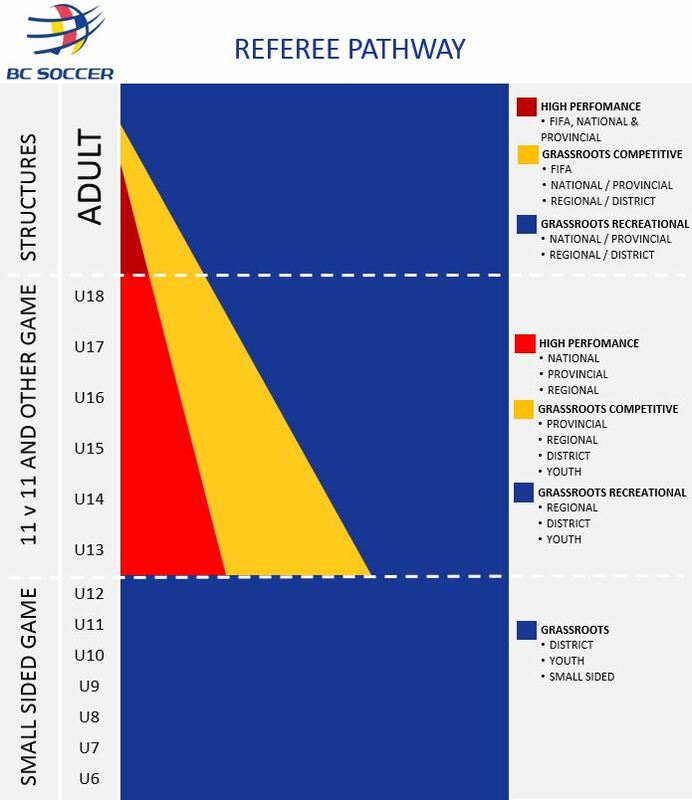 Game reports, included cards given, need to be entered in BC Soccer’s Ref Centre system. If a red card is given, ou need to collect the players card, file the game report, and send the red card to ?? There are two ways to get started as a soccer referee: the small-sided clinic (minimum age 12), or the entry-level clinic (minimum age 14). There is no maximum age for either. Poco Euro-Rite FC hosts a small-sided clinic, an entry-level clinic, and a refresher clinic at some time in August – September each year. Information will be updated below once dates are confirmed. Successful completion of the Small-Sided Clinic certifies you as a Small-Sided game Head-Referee. All small-sided referee candidates must be 12 years of age before or on the date of the small-sided game clinic. The small-sided clinic is hosted annually by the club (typically in early September), which qualifies you as a Small-Sided Referee. The Small-sided clinic is 7 – 8 hours. Registration is through BC Soccer Directly. Courses can be taken anywhere in BC, but taking the course within our club is reccommended. BC Soccer lists all upcoming clinics on their website www.bcsoccer.net. The Entry-Level clinic is the entry point into the Provincial Referee program and may be taken by anyone age 14 or older on the day of the clinic. Sucessful completion of this course allows you to Referee or Assistant Referee on full sided games. If you are under 16, you are classified as a Youth Referee; if 16 or older, you are classified as a District Referee. The goal of this three day clinic is to ensure that individuals who pass are capable to be either a Referee or an Assistant Referee in 11 a-side soccer. This is done with experienced referee instructors who use video educational material and practical on field sessions. The topics covered include, but are not limited to the Laws of the Game, Positioning, Signals, Administration of the game, and Pre-Match Preparation & Match Reporting. 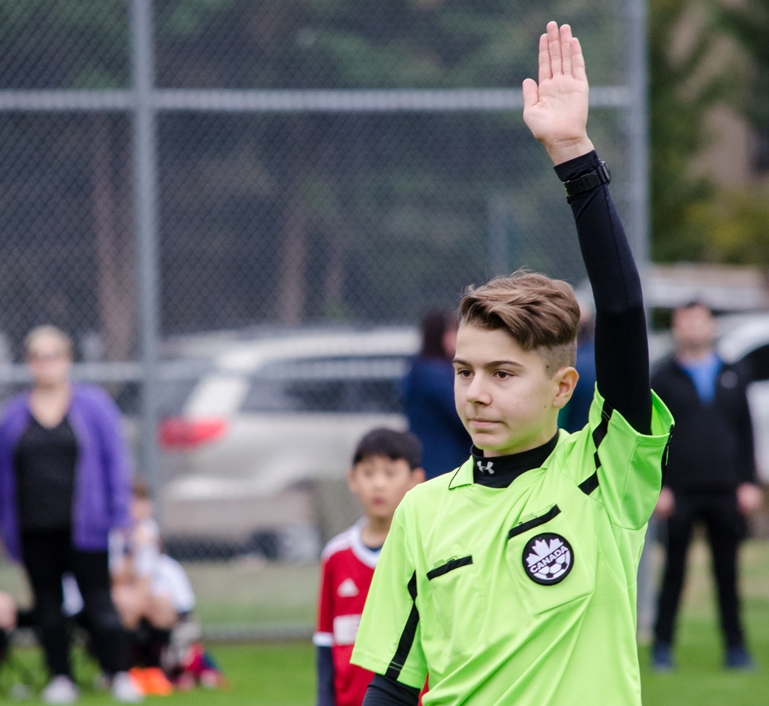 NOTE: although this is not an official policy, new Youth or District referees with no prior small-sided refereeing experience can expect to start out the first season on U11/U12 matches and AR assignments. 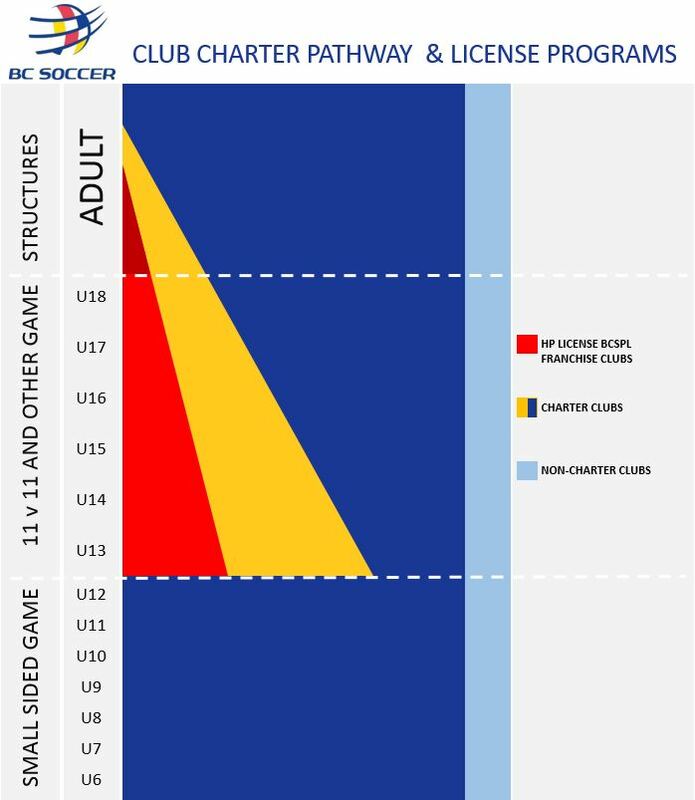 The Entry-Level clinic may be taken anywhere; BC Soccer lists all upcoming clinics on their website www.bcsoccer.net. Registration is through BC Soccer directly. Small sided Referees must pass an online refresher course each year to renew their certification – there is no fee to renew. All Youth/District Entry Level and higher level referees must take an annual in person refresher clinic to maintain their certification. The cost of the clinic itself is free but you must then pay your annual registration fee to BC Soccer in order to register for this course. Important: If you do not register, pay and attend the refresher you may not be allowed by BC Soccer to officiate at any games. 1) Weather related cancellations – ONLY the referee can cancel a match due to weather, and then only for safety reasons. You are expected to show up ready to play. If you feel conditions are unsafe for play, please discuss this with the referee before kicking off, and a decision can be made. Coaches are NOT to decide on weather related cancellations the morning of a scheduled match. If the City closes our fields, you don’t need to do anything. We will take care of cancelling everything. Ref’s know to look each morning just like you. If you are playing a team from outside the club you need to call the other coach and let them know of the cancellation. 2) Cancellations in Advance – Cancellations in advance MUST be discussed with your coordinator beforehand. Doing this incorrectly can result in forfeitures and fines from the league. Coaches should not be cancelling games on their own. Once a decision has been made, please confirm with the club scheduler via clubscheduler@pocosoccer.com. 3) If the Ref has not arrived 5 minutes before kick off, please call the club scheduler at 604-518-8344. Referees for exhibition matches involving club teams may be requested or arranged through the club scheduler. The home team is responsible for field and referee costs, and is expected to pay the referee(s) directly in cash prior to the start of the match.